Providing the Phoenix area with professional, fast and eco-friendly junk removal services. Junk King Phoenix does all the work. They mean that literally and figuratively. You don’t have to bring anything down from upstairs or move anything out to the curb. You can literally sit back in a chair and point to all the things you want taken away. You’ll be amazed at how quickly it all gets done. The crews working for Junk King have a lot of experience in this type of task. 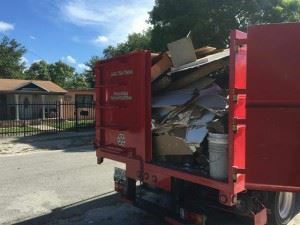 They can assess any junk removal situation and come up with the best approach for fast and efficient junk removal. You’ll be eager to add your positive review after just one session with Junk King Phoenix. This entry was posted in Phoenix Junk Removal and tagged Junk King, junk removal, reviews on September 30, 2017 by Junk King. Last updated October 1, 2017 .